World Body Painting festival attracts more than 30000 people every year to see stunning art which is combined with music and shows. This annual festival takes three days. Over the years the festival has been hosted in different towns and this year it will be in Klagenfurt Austria. The capital of Carinthia will turn into multicultural, international Open Air Artspace where various Bodypainting artists will compete in different categories. Festival has a very long and interesting tradition. This year the festival celebrates 23rd birthday. Painters from all over the world comes and contest in many different categories such as painting with a sponge or a brush, face painting etc. Winners of each category are awarded with cash prizes. Moreover, this year will lead artists from up to 50 nations. In this contest artists use various tools, not only brushes. Some even use latex makeup. 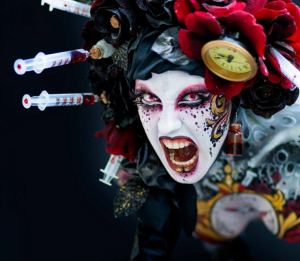 To reach the best effect, artists also use massive headgears, stunning hair styles and many various details that complements the bodypainting. Models are selected before the festival starts. They have to be older than 18, full of courage and to be able to represent the main idea of the event. Models send their pictures, in which their face features and full body should be seen easily. The artists receive the pictures and select models they want to work during the festival. The models have to be not only brave but very patience too, because painting process may take up to 6 hours. This much takes till their bodies become marvelous pieces of art. This year the festival contains World Championship in Bodypainting (6 categories), Airbrush, Special effects and Installation Art, where body painters show installations on different spots, places and tell the visitors stories of their work. More awards will be given out to Makeup artists. Moreover, festival contains fashion shows and many other presentations. Bodypainting art takes a long time, it is very detailed and it is important to capture it before it is simply washed away. So there is a strong connection between bodypainting and photography. This festival offers photographers an amazing opportunity to capture great art and compete with each other in international photo contest “World Bodypainting Photo Award”. “World Bodypainting” festival is kids-friendly: this year there will be special program for the children, which includes yoga, slacklining, DIY stations, acrobatic and children theatre. This festival presents itself as open art park with entertainment for both young and old that is open the whole day. During the festival, the audience can not only watch the artists paint, but also listen to musical performances. Street musicians, national and international bands can also be found during the festival. This year 19 musicians will be performing in the festival.